The only editing done on this photo was to re-size and rotate. 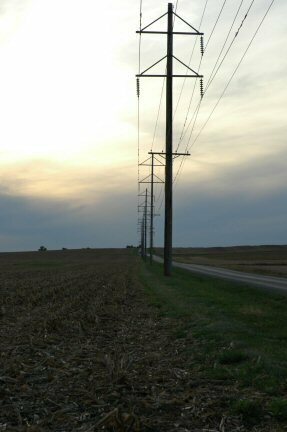 This is my post to those of which stated that these are not phonelines but are actually powerlines: You are 1/2 correct, here in rural Illinois the power and phone lines are on the same pole! If you looked closer at the image you would have seen that there are 4 powerlines and then lower on the pole is a crossbar... that holds the phonelines. Cropping the top of the first pole off, above the phonelines would have created an off-balance appearance to the rest of the photo. I did expect an avg. score on this image and challenge (as it is my first) and that is what I got. Thanks to all who made helpful comments, it at least lets me learn what to fix and how to take a better photograph. I like this idea. I also like the scene, though I wonder if the rule of thirds (2/3 sky, 1/3 land would be cool in this case) would have chopped out some of the foreground dirt, and given the lines a real zooming effect out to the horizon. Proudly hosted by Sargasso Networks. Current Server Time: 04/23/2019 04:42:14 PM EDT.